A performance at a gallery challenged the conventions of what is food, sound and a musical instrument. "Workshop Party presented by sound artist Mamoru and Komatsu Sound Lab"
Hosted by Yuka Contemporary, the new gallery just opened in the Waseda University district, Mamoru Okuno’s performance/workshop was part comedic storytelling, part experiment, part cooking lesson and part ceremony. Hailing from Osaka, he has been refining his sound art performances since his return to Japan in 2001. Originally training as a musician in New York under the tutelage of musicians Ron Carter, Bruce Barth and Arturi O’Farrell, he went on to develop his own combination of sound performances influenced by the study of Japanese aesthetics. Developing the concept of multi-source channels, his work began to engage with its own distinctive language that occupied a space between art and music. In the last eight years he has performed in Japan, America and Europe and collaborated with a wide range of other artists, musicians and dancers as well as completing residencies in Armenia, Quebec and Vienna. With upcoming performances at Salon Tateba and participation in the “2010 Experimental Sound, Art and Performance Festival”, this intimate “happening” was a great chance to catch his new work ‘etude no. 12: variation for eating nori tsukudani (lava boiled down into soy)’, from the ongoing “Etude” series which “transforms everyday objects and practices into “sound art” or “means to create sound art” by de-coding/re-coding them.” Recent works have been balancing the verbal and aesthetic aspects of his work, incorporating more conversation and audience interaction. Throughout the series the central aspect remains utilizing everyday objects to draw attention to their sound qualities and the use in the formation of ritual. In the pre-show white cube space a sparsely decorated, home-assembled wooden table formed the centrepiece to a sembe-making production line. Osaka crackers were spread with nori paste, mustard and salad cream then mixed and served like okonomiyaki to the audience. Initial reticence to take the offering was won over by good food, good music and good jokes. Soon most participants were happily crunching, chatting and enjoying the sound provided by Susumu Komatsu. Komatsu explained in detail the process of building the visually appealing and high quality amp and sound system. He is one of many collaborators drawn to Okuno’s dedication to manifesting the fine-tuned nature of the sounds of the everyday. Okuno’s practice is reminiscent of the Gutai group and happenings of John Cage in the sense that they are both time-specific but also recorded. People gather, forming relational situations within which the interactions are drawn attention to. This is an art where the personal vision of the artist is contained and grows from within the context of exchange. It is an art of process, that transforms not through an imposition of creative will but instead through a gentle focusing on what is there. However, unlike the Gutai group or Cage, contemporary work has access to not only a whole new set of technologies but to different theoretical reference points. Choosing to relate his work to the framework of relational aesthetics we encounter objects transformed through the act of creating (making) giving and receiving. Food, sound, conversations are all channels for an overall act of boundary crossing where our expectations and way of perceiving are challenged. 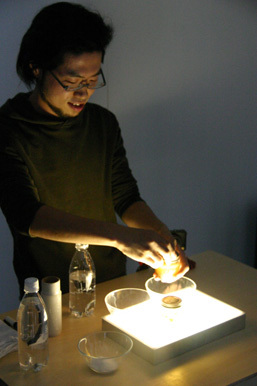 Within this workshop the final act involved the two nori paste containers being placed on a light box ready for use as vessels of sound production. Amid the white light glow they were thoroughly washed before bubble wrap was placed inside. One by one audience members placed the jars over their ears to listen to the sound of bubble wrap popping, before receiving a set of instructions as a gift. The silence and formality was like that of a graduation ceremony. Perhaps cultural context added an extra layer of meaning to this particular rendition, making it work especially well in Japan, but regardless I look forward to seeing future variations on the theme. Mamoru will have another performance on November 19 at Salon TATEBA (Daikanyama) and is taking part in the “2010 Experimental Sound, Art and Performance Festival” (next year at TWS Hongo). For more on sound artist mamoru (Mamoru Okuno), see his homepage. Readers interested in alternative sound performances might like to read our report on the “Sound Gardening” event at Kiyosumi Gardens.